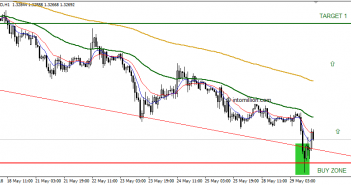 GBP/USD shows the first reversal signs – Time to BUY or ..? How steady is the US Dollar in an unsteady market? Where to find answers to your Trading Questions? Since the foundation of the project, we have been trying to turn one Dollar into a Million. Many dollars were lost on the way to the cherished goal. Nobody said it was going to be easy. However, we believe that everything is possible. Each time we lose a Dollar, we start again stronger with more experience and dedication. Today the project is much more than just about a Dollar. Our philosophy is openness and transparency. So apart from trading on Forex, we are creating a variety of useful Tools, sharing our developments, ideas, and experiences with our followers. We are true fans of financial markets and looking forward making trading more understandable and showing that profitable trading is possible. We begin to look closely at #aussie crosses. Might be a good trades against #aud, after #rba statement on February 5. #euraud long is in focus. It is hard for the #Euro to grows against the #greenback. 2.5% Federal Funds Rate vs. almost 0% of an interest rate on EUR. We see #eurusd @ 1.11 level below 1.1555 resistance. Can go deeper. All information on this page is subject to change. Forex, Futures, and Options trading has large potential rewards, but also large potential risks. The high degree of leverage can work against you as well as for you. You must be aware of the risks of investing in forex, futures, and options and be willing to accept them in order to trade in these markets. Forex trading involves substantial risk of loss and is not suitable for all investors. Please do not trade with borrowed money or money you cannot afford to lose. Any opinions, news, research, analysis, prices, or other information contained on this website is provided as general market commentary and does not constitute investment advice. Intomillion.com owners and affiliates will not accept liability for any loss or damage, including without limitation to, any loss of profit, which may arise directly or indirectly from the use of or reliance on such information. Please remember that the past performance of any trading system or methodology is not necessarily indicative of future results.